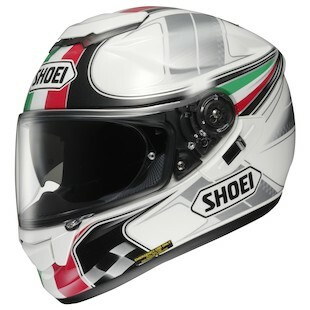 Shoei GT-Air Inertia & Regalia: Science & History The Way We Like It! Inertia: physics… an object in motion will stay in motion (and at the same velocity) unless acted upon by another force to impede that motion. If this sounds familiar, it should… at least if you were paying attention in High School Science class! As motorcyclists we are well acquainted with the laws of physics as we put them to use every day while we ride… (Radius = Speed^2 / ( Gravity * tan( CG Lean Angle ) ) = the principle of counter steering… yikes, someone get the calculator! Paying homage to the intricacies of motorcycle performance which are so inherently rooted in Newton’s First Law, Shoei is releasing the new Inertia graphic on their time tested and true GT-Air. 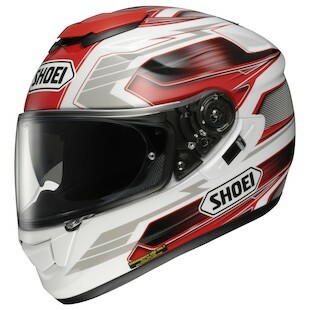 The Red on White color scheme of the Shoei GT-Air Inertia arrives on the scene like the fabled apple which inspired Newton in the orchard. The shading and fading front to back forces the eyes and mind to perceive motion; fast, powerful, crisply responsive and ready to be unleashed on the roads of the world. There are always going to be forces acting against our time on two wheels (work, school, weather, lack of time, etc.). Every day we have a choice to either accept these obstacles as motion must accept physics… or we can dawn the new GT-Air Inertia helmet, pay tribute to science teachers throughout the world, and respectfully blast through the frictions in our lives which act against our desired trajectory as we head out on our own legendary adventures. Regalia: of or pertaining to royalty… special clothes/decorations for official ceremonies. Five-hundred years ago this was a crown, scepter, and a fuzzy robe encrusted with more ice than an above ground swimming pool on Europa! While our gear as motorcyclists in the 21st Century is somewhat different with regard to style and function, we do share the same affinity for the art of dressing to the occasion. The new Regalia graphic seen on the Shoei GT-Air is a subtle nod towards the lineage of classin’ it up the right way and presenting yourself to the world in style. The swooping graphic across the face of the Shoei GT-Air Regalia is less angular and rigid than the Inertia as it guides the attention from front to back with a smoothly eloquent delivery fit for the most resplendent of riders. Not to be misconstrued by its stately position, the Regalia hints at its wildly adventurous side with the checkered race pattern across the bottom of the chinbar and sleek Italian moto colors throughout. Gearing up today is just as important as it has been in centuries past. While the functionality of our choices in attire has evolved a great deal in that time, the purpose and projection of ourselves to which these decisions speak remains the same. So leave the scepter leaning by the nightstand, let the ice’d out robe relax on the hook by the door, and throw on the new GT-Air Regalia to explore the roads of your kingdom!